Look Who Stands with Susan! "As a resident of District 1, I care deeply about choosing the best person to represent us. Susan Gutowsky brings experience and vision to City Council and will do what is right for the citizens of District 1 and our entire community. I proudly support her." "Susan Gutowsky is an excellent public servant for District 1. She cares deeply about our community, and she has demonstrated the ability to work together for the common good." "I believe that District 1 should be represented by a Council member who is committed to ensuring that the voices of ALL of the people are heard. Susan Gutowsky is that person and I strongly support her for City Council." "I have had the great pleasure of serving with Susan Gutowksy as a fellow school board member for the past 7 years. I believe she can take the skills she has developed working on the school board and serve the City of Fort Collins well." "Over the many years that Susan has lived in Fort Collins, she has demonstrated a tireless commitment to serving our community. Through her work on the PSD Board of Education and the numerous non-profits she volunteers with, it is evident that service is her passion." "Susan Gutowsky brings a governing philosophy based on finding pragmatic solutions to issues over political ideology. She is thoughtful in deliberations, diligent on her research, and careful to consider unintended consequences in her responsible decision making." "Susan Gutowsky has the vision to be able to blend the good from the past with the potential for the future. I believe her to be truly entrenched in her desire to utilize her efforts and abilities to help others succeed. She would be a tremendous asset to City Council District 1." "I am fan of Susan's willingness to serve others. During her years on the Board, she was an able and dependable leader and gave great support to the mission and activities surrounding our work at Project Smile. 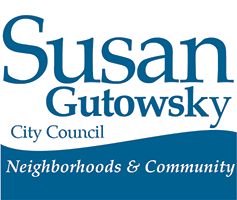 I strongly support Susan Gutowsky for City Council District 1." "Throughout the years that I have known Susan Gutowsky, I have valued her thoughtful leadership, her meaningful experience and her eloquent demeanor. She will bring these qualities to her work on City Council in a way that will contribute to collaborative engagement and mindful decision-making." "Susan is friendly, approachable and communicates well with a wide range of constituents. She has lived in Fort Collins, District 1, for 40 years, so she knows the changes the city has undergone and is continuing to go through. Her desire is for people from all walks of life to be able to thrive in this amazing place." "Susan is a champion for all and a passionate advocate for diverse constituents. She looks at broad community needs to weave a strong government." "As our city grows and we see an influx of newcomers, it is important that someone speak for the members of our community with a less powerful voice. I believe that Susan Gutowsky is that person. It is important that the benefits of living in this beautiful city extend to all of our residents, and having Susan on the City Council fill help us ensure that we all thrive and that no members of our community are left behind." "I have known Susan Gutowsky for many years, and I find her to be a thoughtful listener, fair i her decision making, tenacious in her dedication and steadfastly committee to the greater good. Her presence on City Council will provide inspiration to her fellow Council members and an assurance to the Fort Collins community that their voice matters." "I have known Susan Gutowsky for over 25 years and personally know that she embodies everything that makes Fort Collins great. She is passionate about ensuring that our city is vibrant, clean, safe and livable." "Service is Susan's passion and I am confident she will work tirelessly to ensure our city remains clean, safe and prosperous. Most importantly, she is fair-minded, thoughtful and has a huge heart. I support Susan Gutowsky for City Council District 1." "I have had the opportunity to work closely with Susan Gutowsky on the board of El Museo de las Tres Colonias as we work hard to resurrect 'El Museo' She is passionate about preserving its history and creating a place that can be enjoyed by everyone in the community. The City Council would be lucky to have her knowledge, talent, leadership and ability to work with a wide variety of constituents in diverse demographics. She would be an excellent representative for District 1." "During our work together in the PSD BOE, Susan and I were very interested in developing strategies for non-college bound students to identify their passions and design their learning around their career objectives—with the goal of being workforce ready upon graduation." "Susan Gutowsky was instrumental in the needed to get the non-profit Project Smile started in the Poudre School District. She was one of Project Smile's original board members and volunteered at the dental/vision screenings, putting together the 'goodie bags,' and organizing our annual fundraising luncheon. I believe that Susan's service is her passion. She really cares." "I have known Susan for many years and have watched her in leadership positions, passionately and tirelessly working for people across our community in multiple neighborhoods and across multiple zip codes. Susan will bring this passion to her role on City Council and will serve our community well." "I have known Susan through our work as the Scholarship Chairman for the Rotary Club of Fort Collins. Under her leadership, the committee has selected exceptional, inspirational and diverse PSD students who represent well the treasure that is Fort Collins. I strongly support her for City Council District 1." "Personally, I find Susan to be extremely approachable, open-minded, reasonable, honest and engaging. She approaches her leadership roles seriously and expresses sincere concern for the the people she represents. I highly recommend Susan Gutowsky for City Council District 1." "I have known Susan for 9 years. She considers all sides of important issues and is one of the most responsible, responsive and honest politicians I have met. She has done great work with children throughout her life, has been a very positive supporter of neighborhood schools and an excellent community leader. I wholeheartedly support her in the upcoming City Council election."